Last month marked the beginning of Libraries Week, the annual showcase of all the creative, innovative and diverse activities UK libraries have to offer the public. The key role libraries play in terms of bringing communities together, is particularly important in a global city like London where the wealth gap between the top and bottom of society continues to widen inexorably, and where public space is at a premium. It is becoming increasingly difficult for people with minimal incomes at their disposal to access modes of information and entertainment outside of the home. With the rise in the level of in-work poverty over the last decade due largely to the normalizing culture of zero-hours contracts and part-time work, access to the paid cultural aspects of a city like London is fast becoming the domain of the few as opposed to the right of the many. This is where public libraries, as alternative spaces, come into their own. Many people regard libraries as the most valued and trusted resources at the heart of communities because they foster not only learning but social, cultural and economic well-being. Indeed, there are many reasons for arguing that the library is the most important place in town. Public libraries are one of the few spaces where people can enter a world free from the dominant modes of corporate culture. In addition to offering an alternative to the increasingly atomizing space of the home, they provide people with the opportunity to temporarily escape from a ‘brainwashing’ narrative that portrays them as “a corrupting, anti-social group that exist outside of society.” Think of shows like ‘Jeremy Kyle’ and ‘Benefits Street’ and you get the picture. In that sense, public libraries are more than just books. Not only do they provide a space for people to escape, they are also beneficial in terms of the health and well-being of society. They help to foment children’s literacy and encourage them to become active during term-time and holidays. They are used by parents and nurseries. They offer access to the internet. They provide space for people to read and study in peace that is not always possible in their homes. They are places to host community events, training and education. They provide respite for the mentally ill and a space for people with physical disabilities who perhaps feel isolated in the home, as well as offering a temporary sanctuary to the homeless. Arguably, most prescient of all is that libraries represent the very antithesis of the fast-paced rhythm of modern life. They are, in other words, the embodiment of all that is good in society. The process of reading books is a slow-burning aesthetic pleasure that cannot be reduced to a soundbite phrase or snappy commercial. Furthermore, books are tangible things, not abstractions that exist in ‘clouds’ and can be taken away for free, a system paid for through taxation based on the concept of reciprocity. These represent values at odds with a Tory government that knows the price of everything and the value of nothing. It is hardly surprising, therefore, that the Tories want to minimize the opportunity people have for accessing narratives that run counter to the prevailing neoliberal orthodoxy and the promotion of greed and selfish individualism that’s concomitant to the demise of the public library. The extent of the library closure scandal throughout the UK was highlighted by Jeremy Corbyn in 2016. The opposition Labour leader cited Freedom of Information (FOI) figures indicating that since 2010, 575 council-run public libraries have either been closed, transferred to community groups or outsourced, a trend that is set to continue into 2019. Drastic cuts of this nature clearly contravene the 1964 Museums and Public Libraries Act which was introduced in order to ensure council’s didn’t renege on their duty to encourage use of library services. The Act legally requires local authorities to provide comprehensive and efficient library services. So the question is, why does the Tory government want to get rid of them? Part of their rationale appears to be that many libraries sit on prime value land. But this is not the only reason. Ideology arguably plays a more significant role in terms of the asset-stripping of this important public utility. This is illustrated by the decision of the London Borough of Barnet to approve 12 separate planning applications at a cost of more than £14m to close libraries in an attempt to save less than £2.3m (a massive 2177.5% increase in cost per user resulting from these drastic cuts). Library closures come down hardest on children. A 2016 study by brain specialist and child development expert, Dr Aric Sigman reveals concerns about the permanent damage to health, development and achievement the prolonged and repeated reading from screens, as an alternative to reading books, has on children. Libraries Week reminds us that libraries, as with the NHS, are too important a public service to lose. 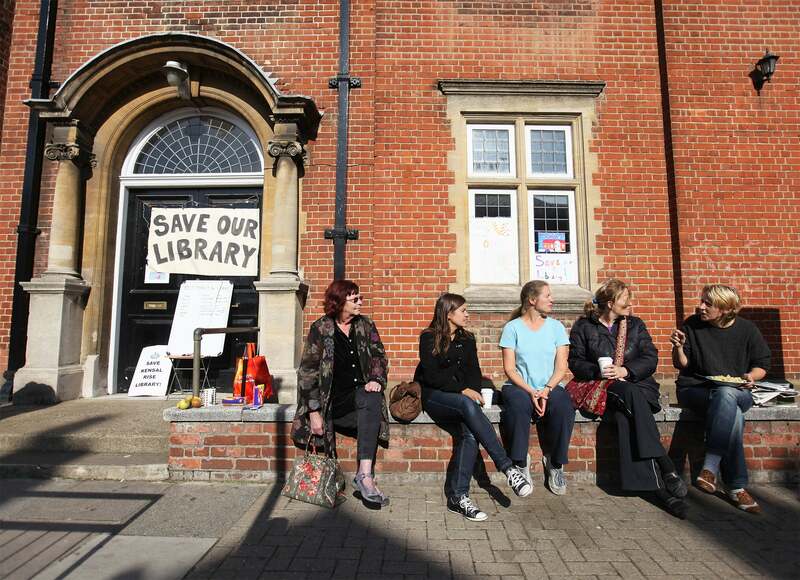 Tory plans to cut libraries to the bone are not only illegal but are detrimental to the health and well being of the public essential to the maintenance of a cohesive society. The attempts to close them must be resisted at every turn.